Most months we meet on the second Tuesday of the month in the atrium meeting area at the Springdale Holiday Inn. I will begin adding upcoming meeting dates to the calendar of events but you can always email me (Sandy) or our board President Liz Lottman (Liz Lottmann) for more information. Frequently we receive contacts from bands playing shows in the region or sharing CD releases and other exciting news. We love hearing from everyone and we want to support your endeavors, however we reserve our OBS Facebook page timeline for events OBS is partnering in as well as blues news of national interest. At the suggestion of our sister society (Spa City Blues Society) president, Larry Glover, we have decided to run a separate Facebook page for YOUR events. Postings to the timeline are open to everyone. We ask that posts be blues related. They may include, your events and festivals, your band news, and items of interest to blues bands and fans. Ozark Blues Society reserves the right to edit or remove posts that don't follow guidelines and/or are not family friendly. on Father's Day weekend is Eureka Springs. This year the Eureka Springs Blues Weekend is back June 14-17, 2018. Check out the wide range of events by visiting www.eurekaspringsblues.com VIP weekend package tickets are on sale now! Mark your calendar and join your friends in Bella Vista on July 3rd for an awesome celebration! 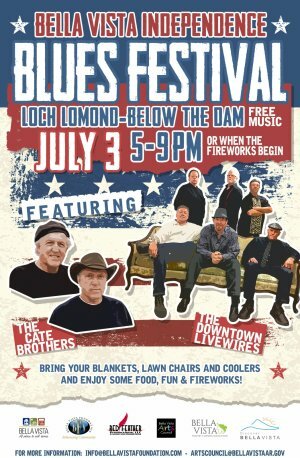 From the Organizers: "The Bella Vista Arts Council and the Bella Vista Foundation presents a Blues concert on Tuesday, July 3rd from 5:00 to 9:00 pm in the park below the Lake Loch Lomond dam on Glasgow Rd. in Bella Vista. This free concert includes “The Downtown Live Wires” and “The Cate Brothers” followed by fireworks. Blankets, lawn chairs and coolers are welcome. Food trucks will be on-site. Email INFO@BELLAVISTAFOUNDATION.COM or ARTSCOUNCIL@BELLAVISTAAR.GOV for more information"
Kirk Brown Band at Memory’s Bar in Monett Mo. Kirk Brown Band at Hickory Ridge in Lake Pomme DeTerre Mo. "It's not people in the South that create racial problems - it's the people who are governing."